Honey bee populations have been falling globally for at least five years due to a mysterious syndrome dubbed Colony Collapse Disorder (CCD). 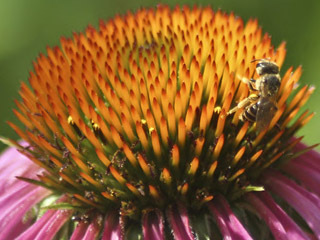 A study published November 2 in the online journal PLoS One suggests that the interaction between a widely used in-hive medication and certain pesticides may be contributing to disappearing honey bee colonies. David Hawthorne and Galen Dively of the University of Maryland tested whether the antibiotic oxytetracycline, widely used in the bee industry, was making bees more vulnerable to the toxicity of popular pesticides by affecting the bees' ability to effectively excrete the chemicals. In the experiment, healthy honey bees were treated with oxytetracycline and then exposed to two pesticides commonly used in hives to protect against the parasitic mite Varroa destructor, which only replicates in bee hives. Antibiotic-treated bees were much more sensitive to both of the pesticides and died at higher rates than untreated bees. The researchers then looked at how oxytetracycline was causing the increased vulnerability to pesticide toxicity. Hawthorne and Dively suspected that the antibiotic interacted with specific bee proteins called multiple drug resistance (MDR) transporters, making the bees less effective at excreting toxins. To test this hypothesis, bees were treated with a drug that inhibits a particular MDR transporter. These bees showed increased sensitivity to multiple pesticides, supporting the hypothesis that MDR transporters and an interaction between antibiotics and pesticides may be involved in CCD. These results leave beekeepers between a rock and a hard place. If they don't treat hives with pesticides, they could lose entire colonies to Varroa mites, and if they don't use antibiotics like oxytetracycline, they risk losing colonies to infections like foulbrood. The future of honey bees may require the development of ways to control bacterial infections and mite infestations without the use of toxic chemicals. Colony Collapse Disorder may also be ameliorated by decreasing the use of pesticides in the agricultural landscape. This study shows that even chemicals that are independently safe may have a devastating effect in combination.